» TRAIN YOUR BRAIN To EASILY Attract What You Want INSTANTLY!! TRAIN YOUR BRAIN To EASILY Attract What You Want INSTANTLY!! ​What if I could show you how to train your brain to attract everything that you want in your life? You see, your brain, if you've trained it correctly, will get you anything that you want in life. It's like a GPS system if it's programmed properly. Let me show you three steps for how to attract what you want by training your brain to get it for you. ​Train your brain to choose a "both" instead of "either/or"
Most people are always choosing either/or. When there's something that somebody wants in life, or there's two things that they want in life, they decide which one is more important. Then they go after that. And so what happens is, we're convincing our brain that we can only have one thing or the other. And it becomes a way that we get out of creative thinking. We choose one or the other and we tell the brain the other one isn't that important. You can't have both of them. So the brain says "I'll only focus on creating this one thing in your life for you and you can't have the other thing". An example might be someone says "You know, maybe you've heard this before you can't be rich and happy. Choose one or the other." And there's a lot of different things like that, right? You can't have both. Actually you can have both. You live in a world of infinite possibilities, infinite potentialities. And we live in a totally forgiving, loving, abundant world. We can have whatever we want. It's just that people don't think that they can have everything they want, so they compartmentalize their existence. And then their brain thinks "This is only what they can do in life". 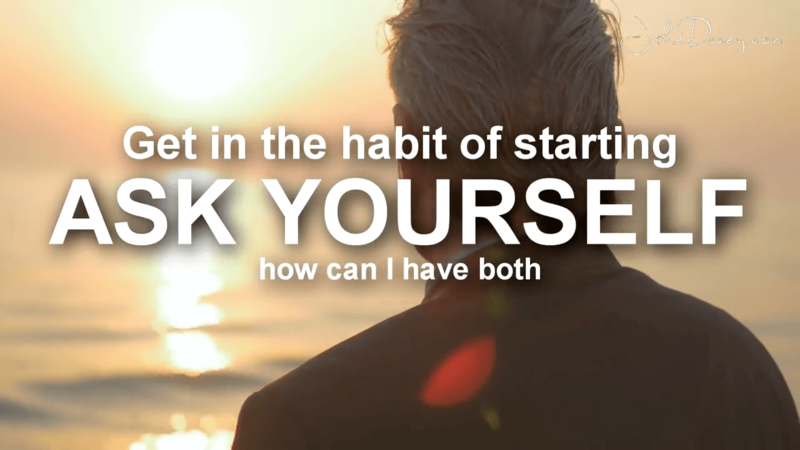 And so, get in the habit of starting to ask yourself "How can I have both?" When you see things come up in your life, how can I have both, right? How can I have both? And what you're doing is you're training your brain to higher level of possibilities. But you're also starting to put yourself in a place where you think creatively about how to create what you want, instead of using it as a cop-out to say "I can only have". "I can only have happiness", or, you know, "I can't have this", "I can't have that a great job and a great marriage", and they'd be really healthy. It's one or the other. How do you have it all? ​Ask yourself, "How can I have this thing?" ​So what happens is, we want something in our life and this blends perfectly with the last one. You know, maybe you want to double your income, you want to make $100,000, you want to find your soulmate, you want to live in your dream house, you want to move to California, or you want to move to Australia, or whatever it is. And what happens is our brains are programmed in order to live very small lives. So when we have a desire, instead of asking "How can I have this thing? ", our brain automatically is programmed from the way our culture is set up, to find out why we can't have what we want. Has that ever happened to you before? You wanted something and then immediately your brain came in and was like "Here's why you can't have it. It's not even possible. Here's why, this is why, and this is why, and this is why, and this is why...". And then that happens to us and we we give up before we get started. So it's this paradox. We've given up and we haven't even gotten started. So if that's happening download my free success hypnosis. I use this to start to reprogram the brain. Because the way the brain is wired is every time you have a thought. It activates a brain cell. And there's a term in neuroscience called Hebb's Law. Brain cells that fire together, wire together. Nerve cells that fire together, wire together. So your brain actually creates a hardwired neurocircuitry that literally controls all of your thoughts, feelings and actions, and makes it automatic. So we're automatically programmed to think that we can't have everything that we want. Or when we get a new desire, we're programmed to think "Why? It's not possible". We need to train your brain. 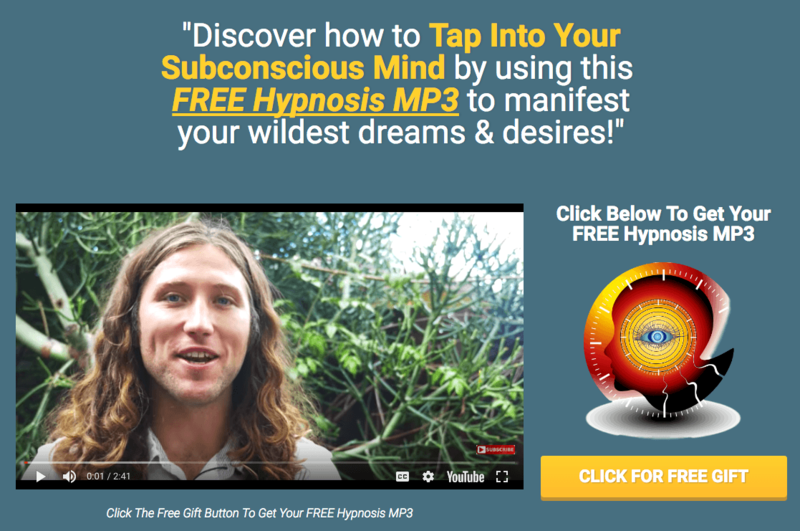 So download my free success hypnosis and you can start to use that to automatically attract success, prosperity and abundance. Because here's the simple thing to understand. You've got to start asking yourself and training your brain to think of possibilities, rather than the lack of possibilities. So the first thing to ask yourself is "How can I have this thing?". Notice that question. It's an open-ended question that pushes you towards possibilities rather than limitations. So think of something that you want in life, whether it's more money, whether it's a new car, or whether you want a new job, whether you want to start your nonprofit. Whatever it is that you want in your life. But get more healthy. Ask yourself "How can I have what I want? How can I have this thing?". How can you train your brain? ​Make clear written goals and carry them with you everywhere that you go. Put them on an index card and read them every single day. I read the same statement every single day. I'm so happy and grateful, and now and I have a statement that says that I am inspiring millions of people. And it goes on and on and on, and it's four or five lines. It's clear and concise. It enters into my subconscious mind easily. I have four or five main goals for 2018, they're in my binder - I have a binder on the ground that has my goals. And I flip through them and I look at them every day. They've proven that the people that set clear and definite goals achieve them and have way more success than the people that don't. Your brain is a GPS system. So how do you use a GPS system? Well let's say you're in Los Angeles and you want to get to San Francisco. How do you use the GPS system? You plug in San Francisco and it gets you there. But if you don't plug in a clear definite goal, i.e. San Francisco, the GPS system isn't going to help you get to San Francisco. But if you do, it's the easiest drive ever. It's like turn right here, turn left here, we'll get you there, here you don't need. You're like just kind of driving, but it's automatically telling you every where to go unconsciously. You don't even need to think. And success works like that. Your brain is like a GPS system. If you give it a hundred thousand dollars a year, meet this person, have this soulmate, get this healthy and you program that every single day over and over, it will create it for you. Much like the directions spit themselves out and you don't need to think about them. You will unconsciously and automatically create success, prosperity, abundance, and happiness in your life when you have clear definite goals. So please when you end this video, write them down on a piece of paper. Put them in your wallet. Carry them with you everywhere that you go. Tape them on your wall. Read them every single day. And download my free success hypnosis to use that with the programming. ​Brain cells that fire together, wire together. A brain is just like a GPS system. You cannot get to where you want to go unless you program the GPS system. You cannot have your brain create what you want if you don't tell it what you want, and train your brain to know that's what you want. So this is Jake Ducey with JakeDucey.com talking about three simple steps to train your brain to automatically attract what you want in your life. Be sure that you write your goals down. Comment down below you're actually gonna do it. I'll see you on the next video thank you for watching. I want to say a big thank you for this as realy change the way see things and life as a whole. Thank you.